A new 6th-gen CPU, a new NVMe SSD, and USB-C make this more than a minor upgrade. 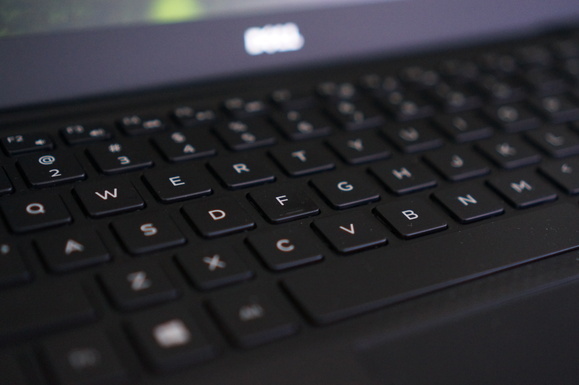 At first glance, most would dismiss Dell’s 2016 refresh of the XPS 13 as minor at best. If you dig into the details though, the upgrade to arguably the best ultrabook of last year is a worthy one. The highlights are the move from the 5th-gen Broadwell Intel chip to a 6th-gen Skylake chip and the inclusion of a rather cool USB-C implementation that we’ll get into later, but there's a whole lot more here. If you didn’t catch our review of the XPS 13 last year, I can sum it up as: great performance, reasonably priced, good build quality and the smallest laptop in its class with a 13-inch screen. I mean, for a 13-inch laptop, this thing is freaking small. Its footprint clearly puts it in the same class as laptops with far smaller screens, such as the Mac Book air 11 or Toshiba Radius 12. As their names imply, those use 11-inch or 12-inch screens. I’d almost put the XPS 13 on a par with Apple’s Mac Book (Not Air) 12, but the Mac Book 12 is an especially lightweight beast. The updated XPS 13’s foot print is still spectacular. Here is last year’s virtually identical model on top of a MacBook Air 13. While the XPS 13's footprint isn’t that much bigger than the Mac Book 12's, the updated XPS 13 is heavier and thicker, as this massive profile shot I lined up below illustrates. As much as some might want to put the Mac Book 12 in the same class as the XPS 13, it’s not. 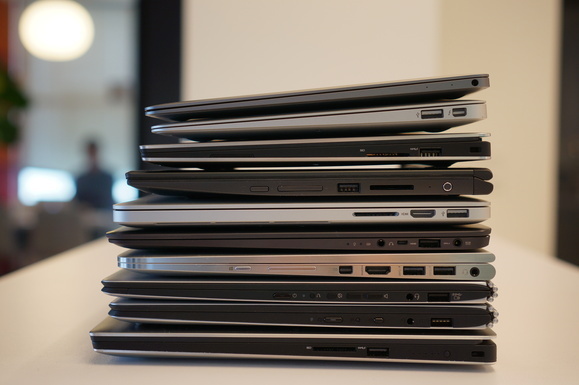 Don’t be fooled by the visual curved surfaces the laptop makers use to make you think they’re thinner either. I measured the three contenders and foundthe Asus UX305 to be the thinnest, with Lenovo’s older Yoga 3 Pro slightly thicker. Truth be told, we’re talking millimeters of difference. The XPS 13 continues to be built more like what they’d call in the old days, a fire plug. From top to bottom: Apple Mac Book 12, Apple Mac Book Air 11 (2014), Dell XPS 13 (2016), Toshiba Radius 12, Apple MacBook Pro (2015), Asus UX305 (2016), HP Spectre X360 (2015), Lenovo Yoga 3 Pro, Lenovo Yoga 900, Dell XPS 15 (2016). Externally, it’s virtually identical to last year’s model. The only tell is the displacement of the mini DisplayPort from last year’s model to a USB-C port. USB-C allows for reversible USB cables that support multiple standards. While I welcome reversible cables, I don’t welcome the confusion. While the USB-C or USB Type C connector can support many standards, they're optional. That means not all USB-C cables support higher data rates. Or DisplayPort. Or Thunderbolt 3. It just depends. In Dell’s case, it took the smart route by supporting pretty much all the standards you need. It has USB 3.1’s 10Gbps data rates, DisplayPort out (using a dongle) and Thunderbolt 3. That means anything you can fit into this port is probably going to work. 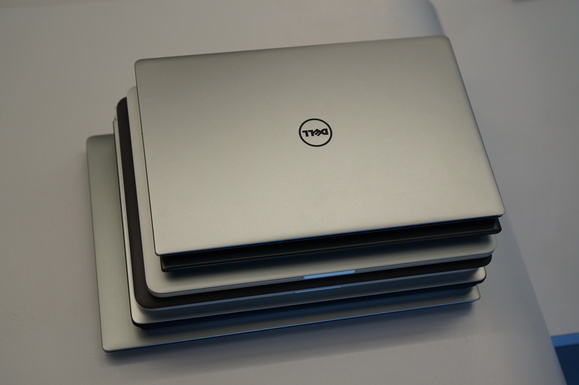 From top to bottom: Dell XPS 13 (2016), Toshiba Radius 12, Apple MacBook Pro (2015), Asus UX305 (2016), HP Spectre X360 (2015), Lenovo Yoga 3 Pro, Lenovo Yoga 900, Dell XPS 15 (2016). The real surprise to me was the support for USB-C charging alongside the standard barrel charger. It ships with the same, standard compact Dell 45-watt charger, but if you have access to a newfangled USB-C charger from, say, a Google’s newest Pixel, it’ll charge. Why not just go all in with USB-C? I suspect Dell knows we're on the cusp of leaving proprietary barrel chargers for the promised land of universal charging. But in reality, Dell also knows universal charging isn’t all it’s cracked up to be just yet. In fact, I ran into the harsh reality of the slippery standard of USB-C charging again with the XPS 13. While I won’t bog down this review with the details, let’s just say while USB-C charging on the XPS 13 works with several third-party bricks, and the company has told me it fully supports the standard, it didn't work all the time. Dell’s design is nevertheless very clever, as you get the best of both worlds—something that reliably works today with the millions of Dell’s bricks, and support for a standard that is rapidly emerging. 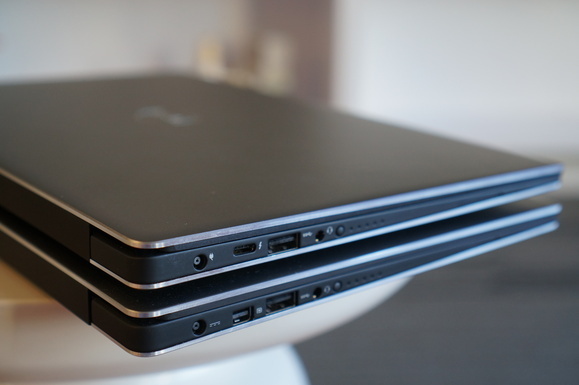 The 2016 XPS 13 on top of the 2015 model. The only real external difference you can see is the move from mini DIsplayPort to USB-C.
For most people considering the latest XPS 13, it’s what’s inside that counts. The mid-range version we tested features Intel’s Core i5-6200U paired with 8GB of LPDDR3 and a 256GB PCIe M.2 NVME drove. All three are steps forward. Last year’s 5th-gen Broadwell is far slower in graphics, and a step back in CPU chores. The 2015 XPS 13 also used DDR3L-RS, which is Micron’s Reduced Standby RAM. DDRL-RS uses roughly 40 percent less energy than standard DDR3L when in standby, while being very low-cost. LPDDR3, though, is the gold standard for power consumption while in standby mode, and the memory of choice in phones, tablets and other laptops. The last internal upgrade is in storage. The 2015 model supported M.2 drives, which can run older legacy SATA or the newer PCIe for even better performance. Last year’s model used the slower legacy SATA. Early in its life cycle, I actually tried to upgrade last year’s XPS 13 to a PCIe drive and failed, because the laptop’s BIOS would not boot to it. With the new XPS 13, Dell finally supports booting to PCIe M.2 drives and does it one better by also supporting the new NVMe standard. The M.2 drive in my review laptop was none other than Samsung’s PM951 NVMe drive. While the SATA drive in last year’s model would top out at 473MBps while reading files sequentially and 264MBps writes using CrystalDiskMark 5, this year’s hit 1,500MBps reads and 307MBps writes. That’s a spectacular upgrade in performance. Unfortunately it didn’t go without snags. As first shipped, the XPS 13’s NVMe M.2 drive was blazing-fast but it also had an issue where it prevented the laptop from going into deeper sleep states and consumed more power than expected. For example, even though Dell has gone to a larger battery with the new XPS 13—57 watt-hours, vs. 52 watt-hours in last year’s—battery life was worse. Dell updated the firmware, promising several “hours” more of run time. We’ll run some follow-up tests and let you know if that holds true. For the gearheads, you just want to know if that Skylake chip is better than the Broadwell chip in the older unit. 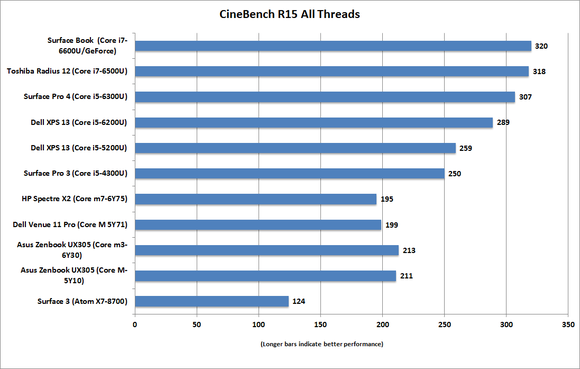 The first test I’ll go over is CineBench R15. It’s a free benchmark that uses Maxon’s Cinema 4D engine to render a 3D frame. It’s pretty much a pure CPU benchmark. Granted, it’s not something the typical thin-and-light laptop user will actually run, but it gives you an idea of how fast the CPU itself is. The Dell XPS 13 with the new Skylake CPU is a nice upgrade over last year’s Broadwell CPU. We know not everyone is going to be doing 3D rendering on an Ultrabook, so we also rely on PCMark 8’s Work Conventional test as a realistic gauge of everyday office drone performance. The benchmark uses a set of internally created programs for browsing, word processing, spreadsheeting and video conferencing. The results are rather interesting. That the new XPS 13 is faster than last year’s model is no surprise. Oddly, both the Surface Book with its Core i7 and the Surface Pro 4 are off the expected pace given their model’s CPUs. I don’t have time to delve into it here, but it’s worth noting. The real upshot of this one test is you’d be hard-pressed to tell the difference between just about any of these devices in a typical work environment. I know, as I’ve tried using most of the units here as daily drivers. When you’re talking email, browsing, and Microsoft Office, I just can’t tell. The only time you feel it is when you dip down to the Surface 3 with its Atom CPU. For most Office tasks, you’d really be hard pressed to tell the difference between any of the devices here save the Surface 3 and its Atom. 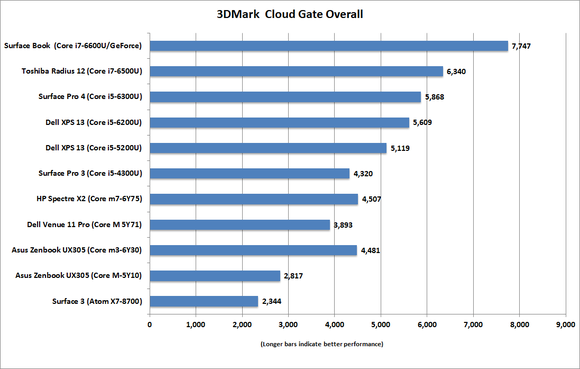 Intel’s Skylake gives you a nice upgrade in graphics performance, and we can see it in 3DMark Cloud Gate. 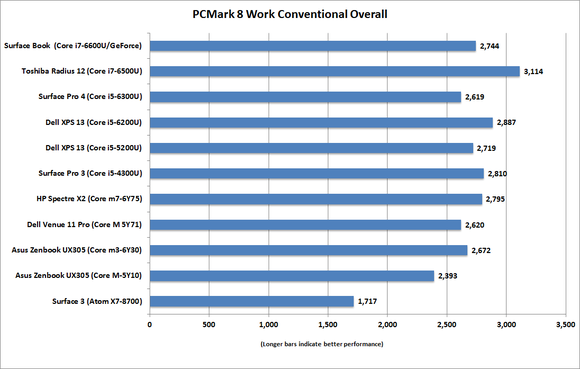 If you focus on just the XPS 13 versions, it’s a decent bump in performance. None of the the laptops here would really make great gaming laptops, but for very old games at lower resolutions they’d be fine. Skylake-based Core m chips get a nice boost in graphics performance. 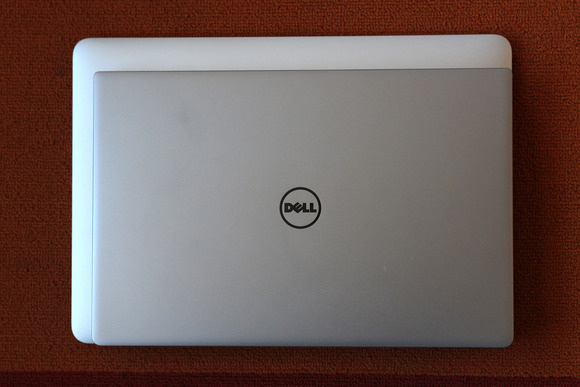 Our new XPS 13 review is probably one of the last ones to hit the streets. Much of that is because of problems we had with our battery tests. It’s a messy affair which must be explained. I initially tested the new XPS 13 with MobileMark 14 and hit 647 minutes of run time. That was unexpectedly lower than last year’s XPS 13, with its 1080p, non-touch panel hit 728 minutes of run time. Working with Dell, we determined that an issue with the M.2 NVMe drive kept the laptop from entering lower sleep states. Once updated, Dell said we should expect several hours' more run time. Unfortunately, in the time between Dell's issuing a BIOS update, Microsoft continued to issue patches for Windows 10 and MobileMark 2014 stopped working. This isn’t a dig at Dell, as several other laptops I’d been testing also started to fail. In fact, as I write this, I still can’t run it on the new XPS 13. As a stop-gap solution, I fell back on a video rundown test. 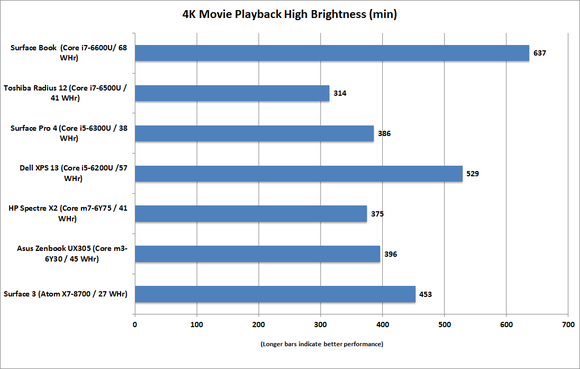 The test uses a 6.5GB 4K video file and is played using the Windows 10 Movies & TV player at a relatively bright 250 to 260 nits. My results for the new XPS 13 show roughly 529 minutes of run time, or just under 9 hours of 4K video playback. To complicate matters even more, Dell did actually update the BIOS to address the M.2 drive sleep issue. Bbut since I can’t run MobileMark 2014, I can’t tell whether it actually fixed the issue. Because the laptop doesn’t sleep when playing video, the results were unchanged. The upshot is all in all, the battery life is good but not stellar. If you’re into stupid long battery life though, Dell sells two different-sized external battery pack for the XPS 13. Battery life on the Spectre X2 was fair with our challenging video playback test. To get the XPS 13 as small as it can, Dell made two compromises The first is the webcam that gets moved into the lower left corner of the screen. It makes for pretty unusual Skype chats. The second is the the keyboard. It’s still just a little cramped with its tiny keys. If Apple can get a comfy keyboard on its MacBook Air 11, why can’t you Dell? Likewise, a much larger-framed HP Spectre X360 keyboard, or even the Surface Pro 3's, feels like loosening up your belt after a big dinner. Staying on top of driver or BIOS updates has also become a chore since the company’s auto update program was found to have security issues. Maybe I’m spoiled, but Microsoft’s ability to push out new drivers and firmware via Windows Update make life a lot easier. HP is also capable of securely (so far anyway) scanning for driver and BIOS updates, so Dell, fix your auto-update system. The new XPS 13 keyboard still feels a tad bit cramped to me.